Young senposai transplant in our hoophouse. After the set-backs with our winter hoophouse greens transplants that I wrote about last week, we worked really hard and got the whole house planted up. 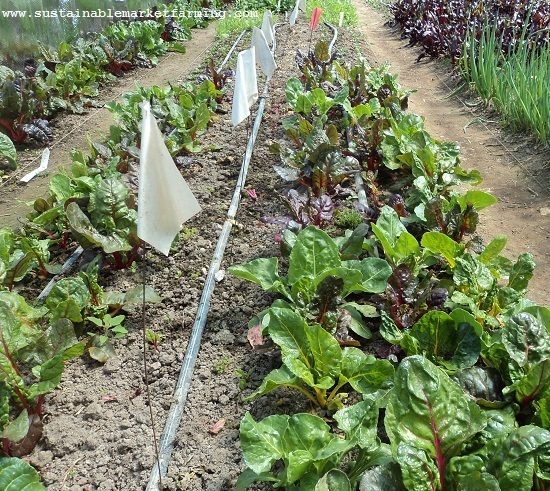 Most of the transplants have recovered from their transplant shock (wilting each day), during the cloudy weather we had. 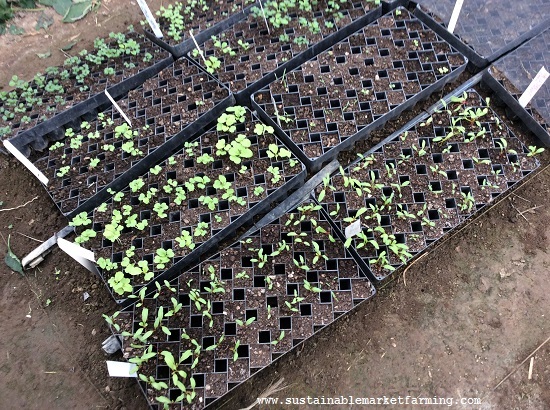 The new seedlings are coming up fast and calling on us to thin them. We ended up not needing so many of the Plan D plug flat plants, but we’ve kept them for now “in case” . Young Tokyo bekana transplant in our hoophouse . Ultimately if we don’t need them, they’ll go in a salad mix. 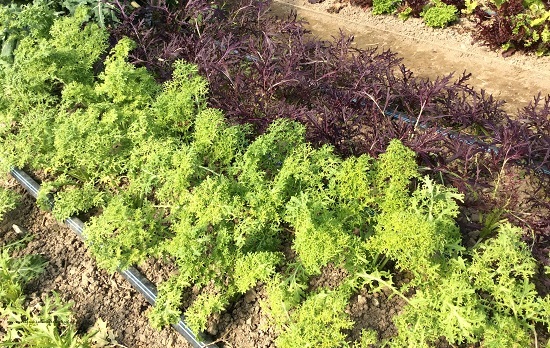 I wrote about making salad mix last year. The past two days I have been able to harvest a mix in the hoophouse. The ingredient we are shortest of is lettuce. 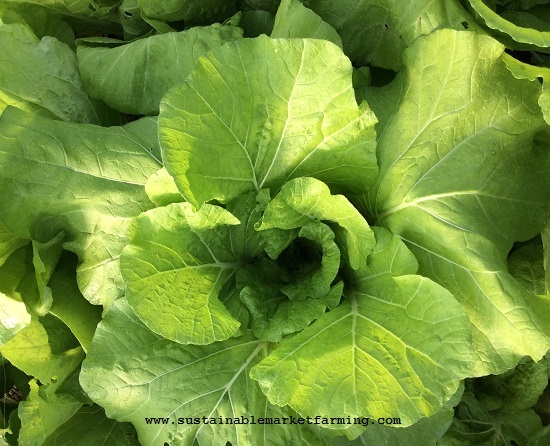 My first mix was spinach, Bulls Blood beet leaves, a few leaves of Tokyo Bekana, Bright Lights chard, Scarlet Frills, Ruby Streaks and Golden Frills, and a handful of lettuce leaves. 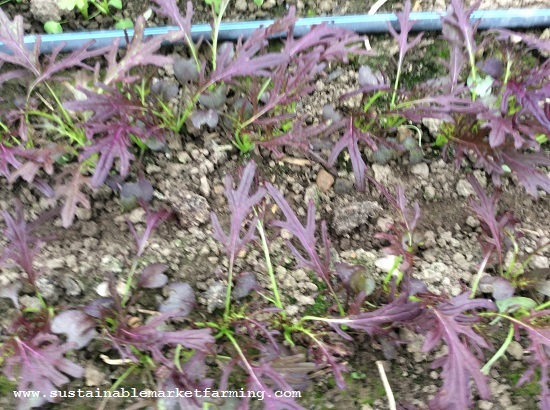 Red Tinged Winter is growing fastest, of all the varieties we planted this year. Ruby Streaks transplant in our hoophouse. Compare with Scarlet Frills below. Golden Frills mustard transplant in our hoophouse. 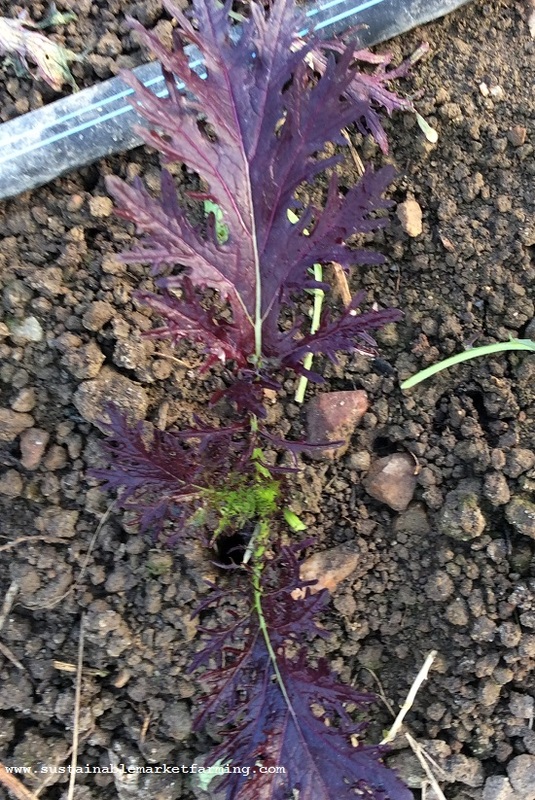 I harvested a leaf for salad mix yesterday. Scarlet frills mustard in our hoophouse. Notice that this crop is frillier than Ruby Streaks. The mix I made today had fewer ingredients. 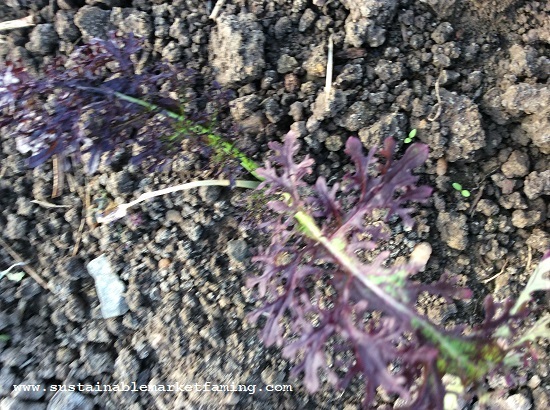 I left the frilly mustards, the lettuces and the Tokyo bekana alone to grow some more. 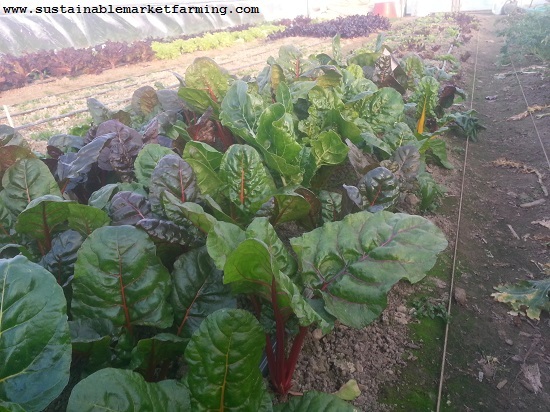 I used Bulls Blood beets, spinach, tatsoi outer leaves and a few Bright Lights chard leaves and stems. For those of you on other social media, here are their handles and links (use the hashtag #CFSAC2018). 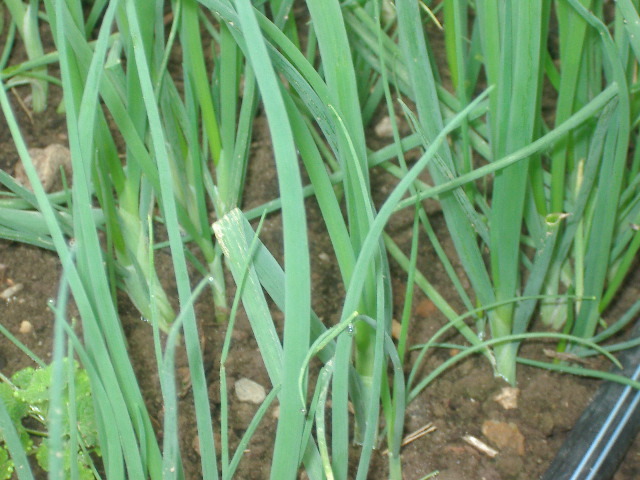 This week we will be popping garlic for planting and having our Annual Garden Crop Review meeting. 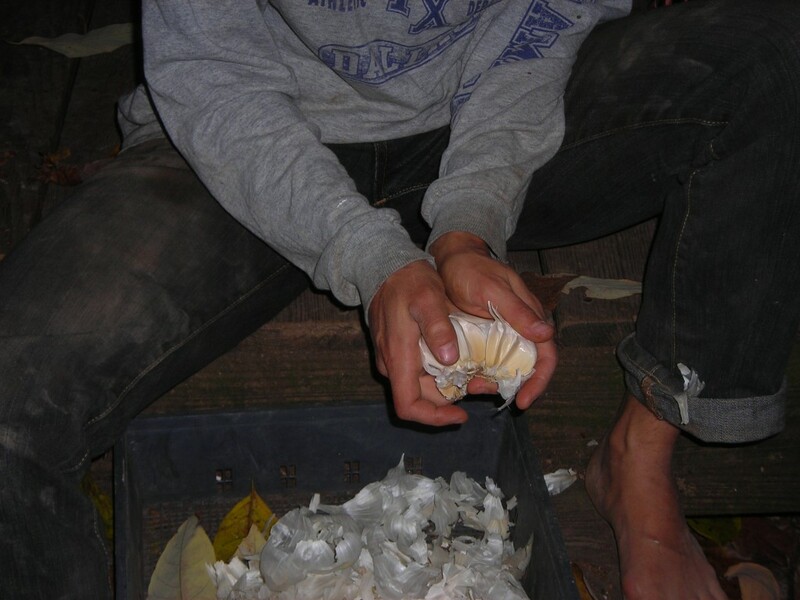 Next week I’ll tell you more about garlic planting as part of the Alliums for November post. Koji Yukina Savoy in late December. I wrote about outdoor Yukina Savoy going into the winter, in my October post. 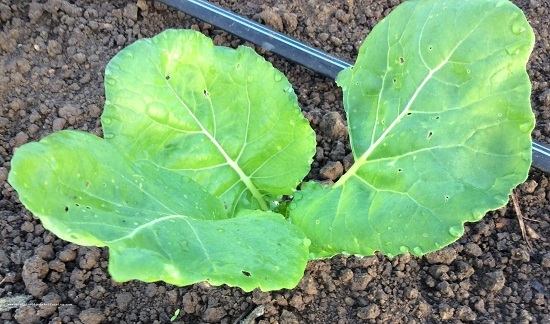 Re-read that to get details of days to maturity, cold-tolerance (10F/-12C outdoors) and the differences between the open-pollinated Yukina Savoy and hybrids such as Koji. 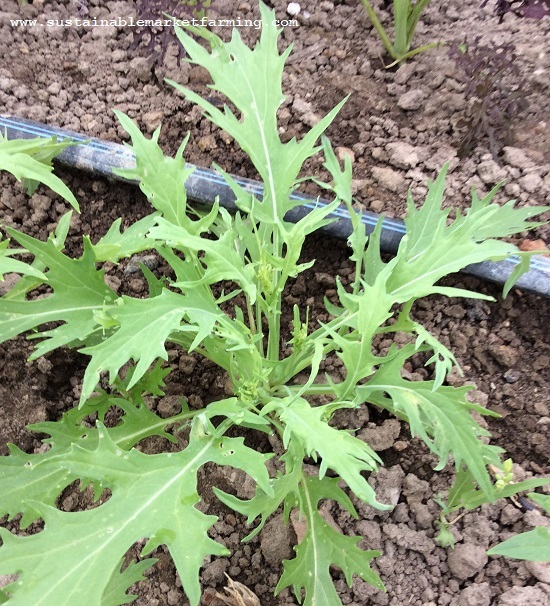 Five months after that posting we are harvesting the last of the over-wintered Yukina Savoy in the hoophouse. 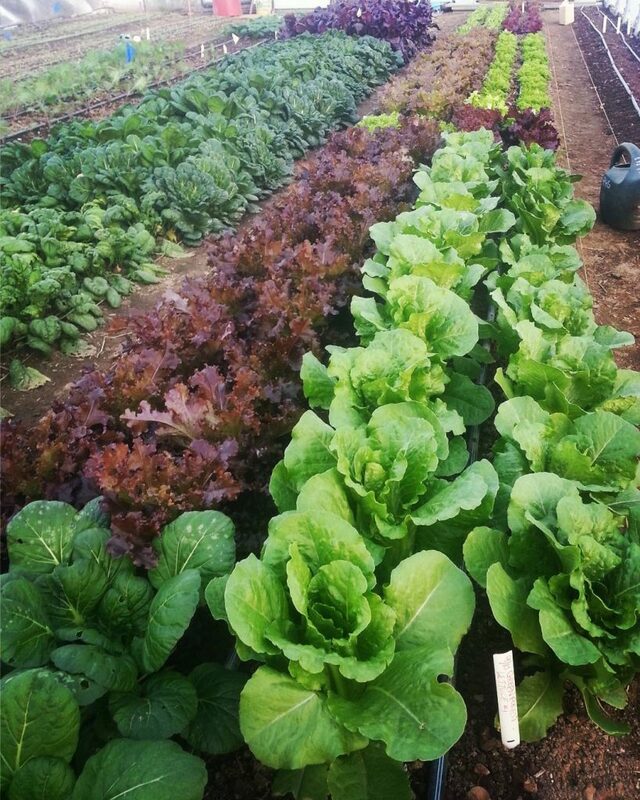 For us, this is a cooking green, not a salad crop. It’s delicious and easy to cook. A little robust for salads, for most people. Young Yukina Savoy plants in our hooophouse. 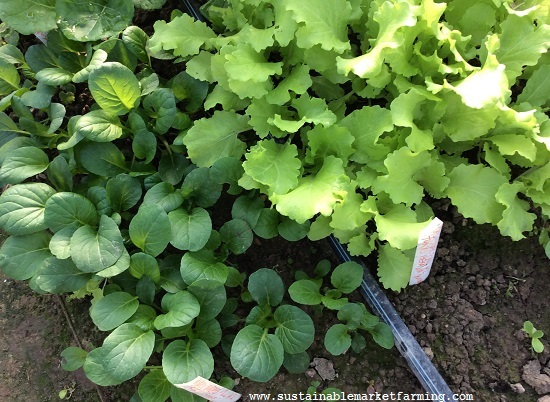 In March we are starting our hoophouse crop transition to early summer crops (tomatoes, peppers, squash, cucumbers) and meanwhile we are enjoying harvests of arugula, brassica salad mix, Bulls Blood beet greens, chard for salad and cooking greens, Russian kales, leaf lettuce, lettuce heads, baby lettuce mix, mizuna and frilly mustards, radishes, scallions, senposai, spinach, tatsoi, turnips and greens and yukina savoy. 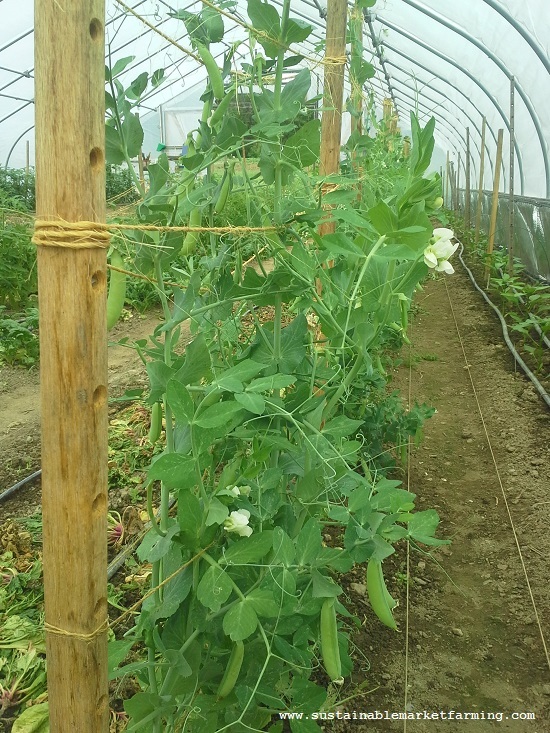 We do two hoophouse plantings of Yukina Savoy: the first transplanted from outdoors on October 6, feeds us from December 5 to January 31. 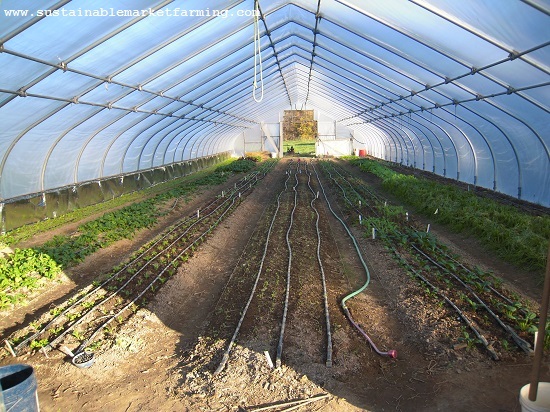 The second, transplanted from outdoors on October 24, feeds us from January 8 to early March, sometimes to mid-March. 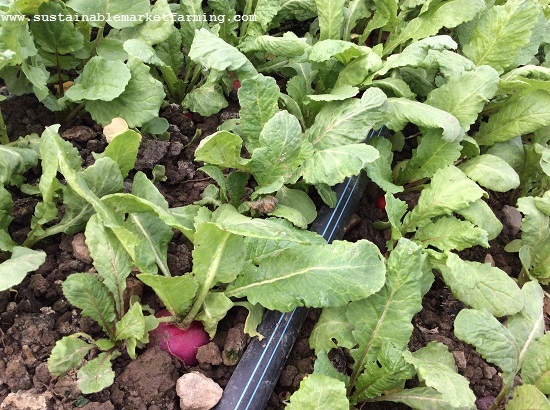 This spring several crops are bolting earlier than hoped-for! We have had some back-and-forth temperatures, which can trigger bolting. 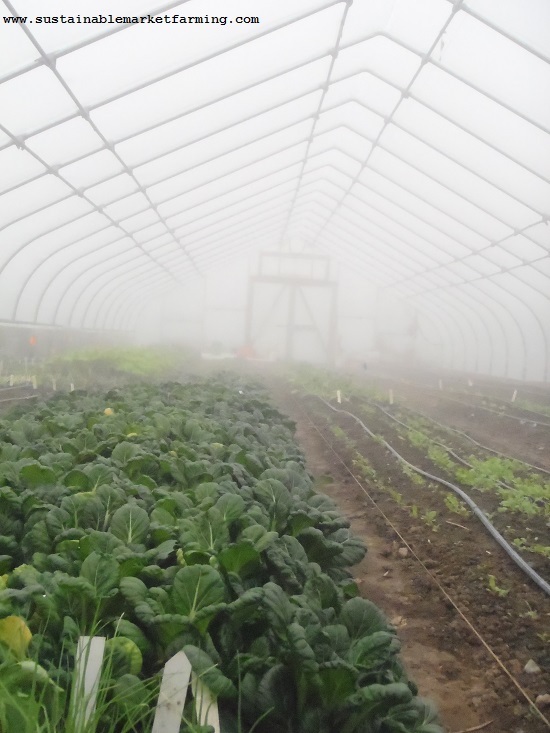 Among brassicas, Yukina Savoy is relatively heat-tolerant. 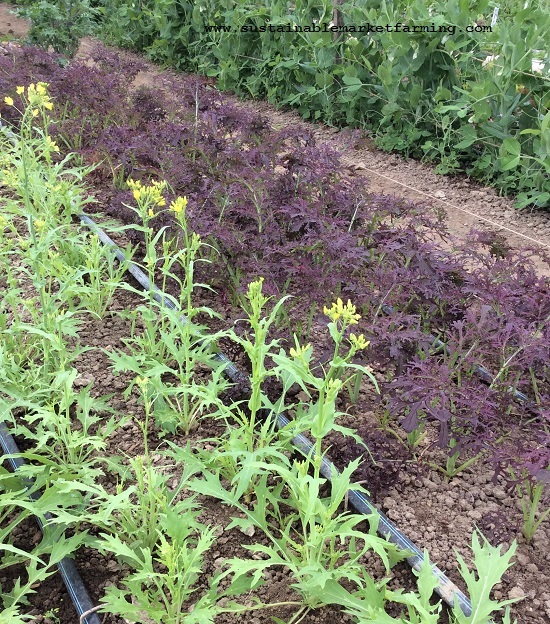 This is part of why we do the second planting – it helps us extend the brassica season until we can harvest more outdoor kale. 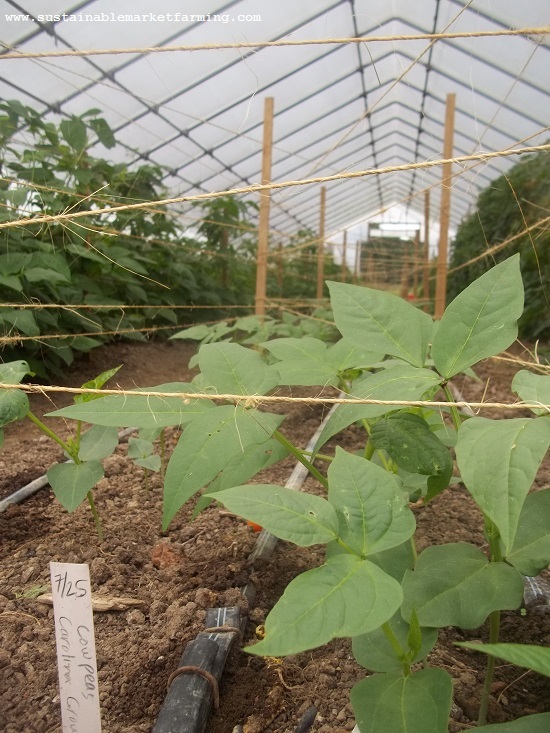 We transplant Yukina Savoy at 12″ (30 cm) apart in the row, with 4 rows to a 4′ (1.2 m) bed. 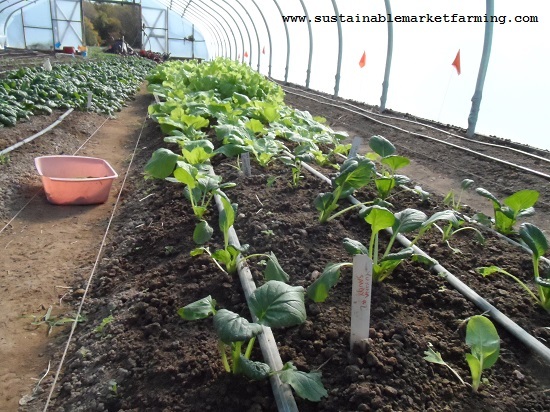 For a hundred people with lots of other vegetables available, we plant 60 in the first planting and 40 in the second. 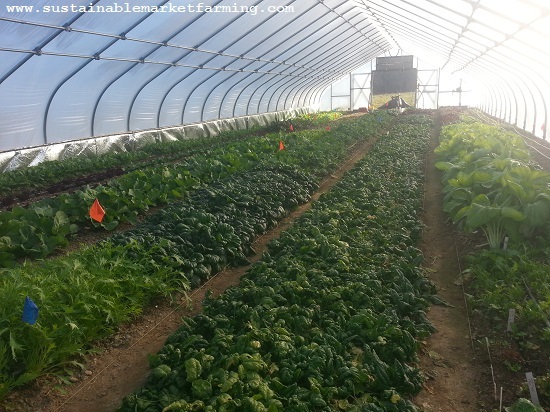 There are too many other crops competing for space in late October for us to plant more than 40. 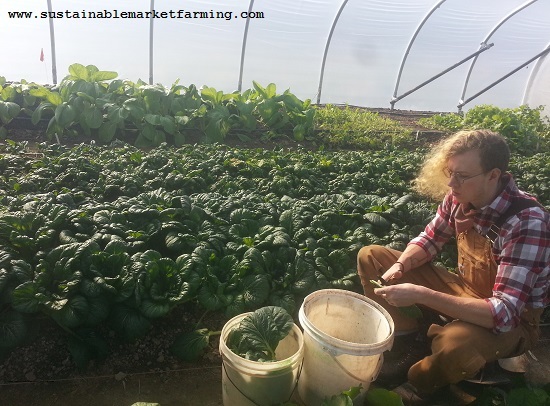 Harvesting Yukina Savoy leaves in late November. Initially we harvest this crop by the leaf, until we see the stems start to elongate prior to bolting, when we cut the whole plant. 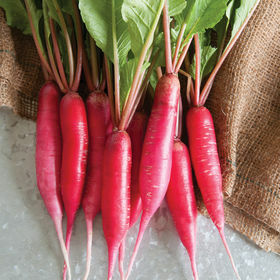 (It is a loose head type of crop, so don’t wait for a firm head to form!) Actually we pull first, then cut off the head, then bang two roots together to shed the soil, and put the pulled root stumps on the bed to dry out and die. This is easier than cutting first and pulling later. If they do bolt before we get round to pulling them, I have added the pretty yellow flowers to the salad mix. Like all other brassica flowers, these are edible. 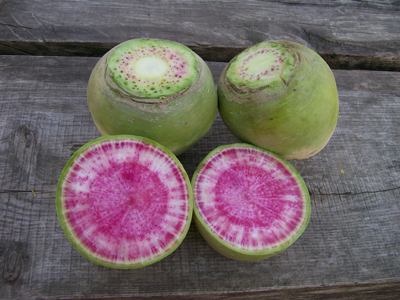 Kitazawa Seeds tells us that Yukina Savoy is a Brassica rapa Pekinensis group, for those with a love of brassica botany and those saving seeds. 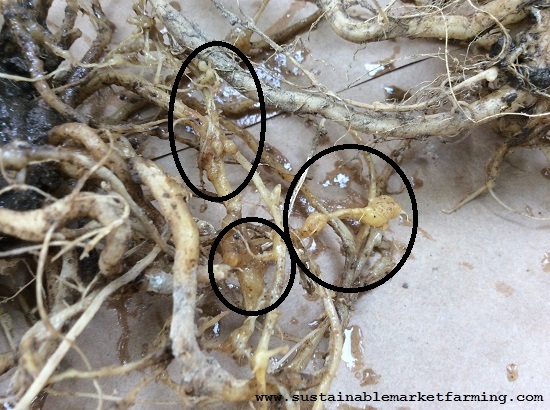 Also those, like us, looking for nematode-resistant vegetables. 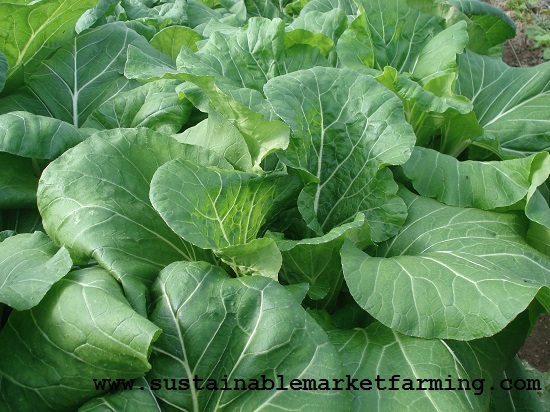 Brassica juncea are the most resistant brassicas. 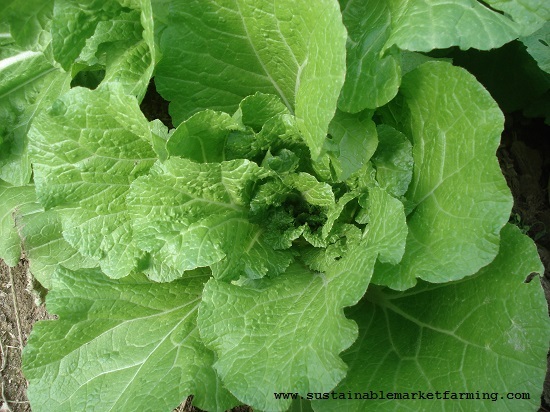 Kitazawa classifies it as a loose head type of Chinese cabbage. Yukina Savoy in the early morning mist. 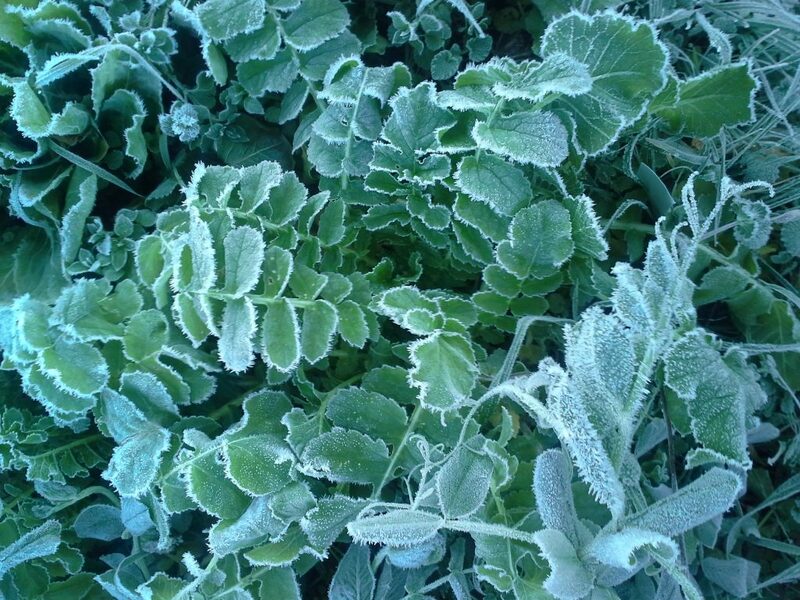 Tatsoi is a very cold-hardy green (down to 10°F, –12°C), one of the ones we grow in our hoophouse to feed us after the winter solstice, when the crops have started to be fewer in number and each is less abundant in production rate. 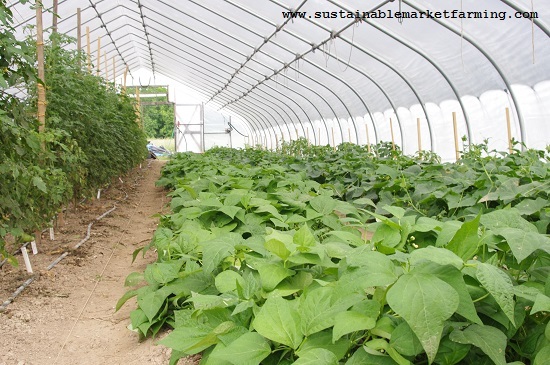 We have also grown this one outdoors in the fall for early winter eating, but no longer do this as the rate of growth inside the hoophouse is much better. 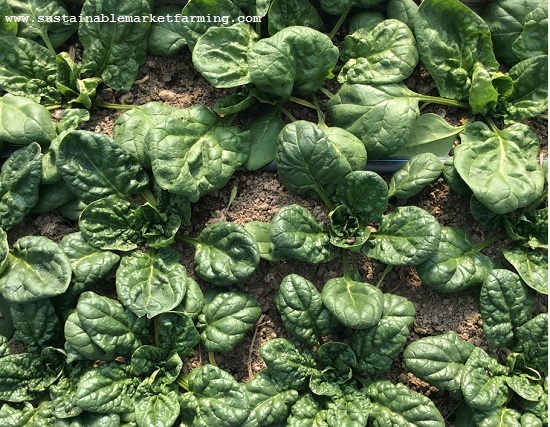 In the fall tatsoi will not bolt, but in late winter/early spring it will. I have been writing about a particular Asian green once a month since last May. To find the other articles, click the category “Asian Greens”. 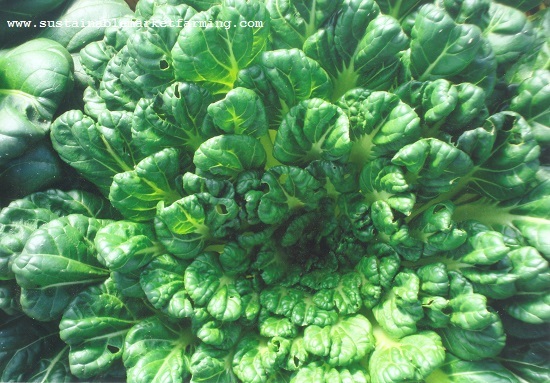 Botanically, tatsoi is Brassica rapa var. 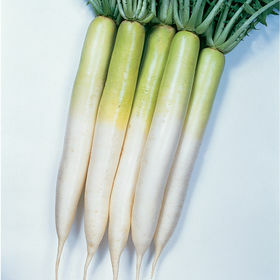 narinosa, cousin of other turnip family greens such as Chinese cabbage, Tokyo Bekana, pak choy, mizuna and komatsuna. 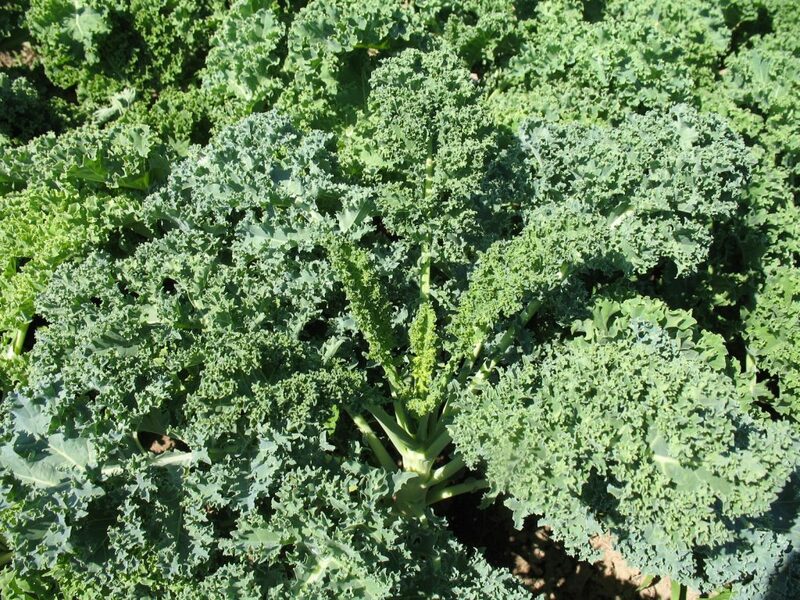 It is a more distant cousin of the Brassica oleracea greens such as Vates kale, Chinese kale and kai-lan, and of crops in the Chinese Mustard family, Brassica juncea (the frilly mustards like Ruby Streaks and Golden Frills). 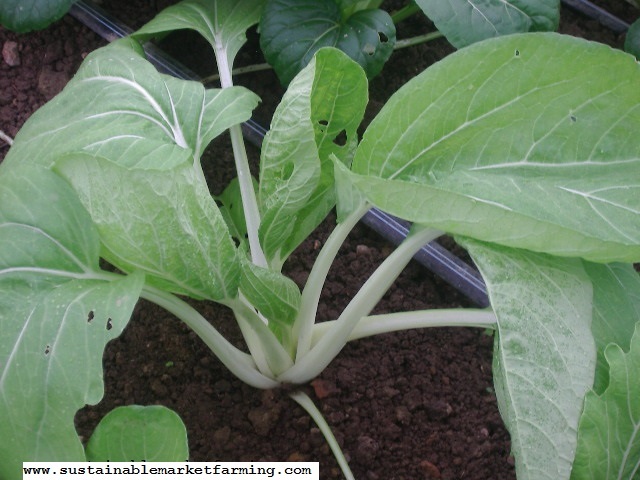 Tatsoi is a relatively small plant with shiny, dark green spoon-shaped leaves and green-white stems. If given plenty of space it grows as a flat rosette, but if crowded it takes on a flowerpot shape. For sale, the whole plants are cut and the leaves banded together, so crowding them does not at all make them less marketable. It has a pleasant mild flavor. Young tatsoi plants in our hoophouse. 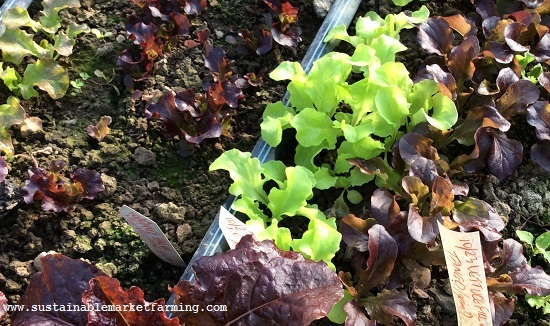 We direct sow and then thin into salad mixes, leaving some to mature at 10″ (25 cm) across for cooking greens. 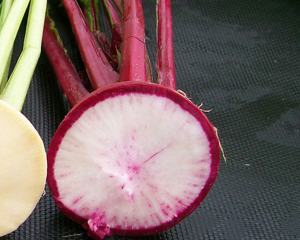 You can also transplant at 3-4 weeks of age in the fall, at 6″ (15 cm) apart. 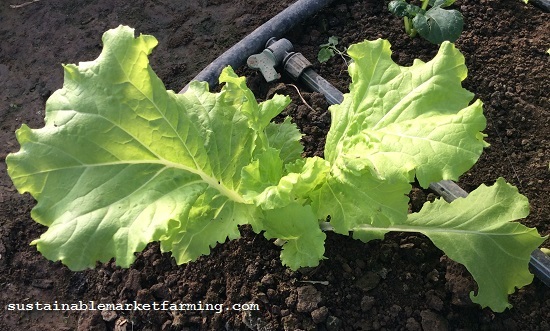 Although we transplant most of our brassicas, to allow the beds more time without this crop family (which we grow lots of), we direct sow this one, which will have many plants in a small space. 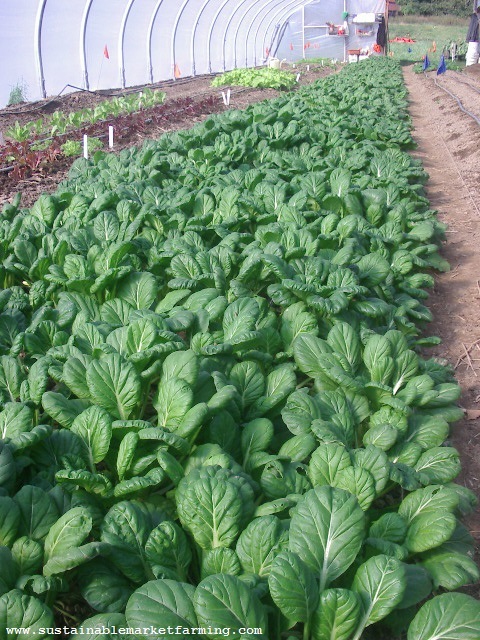 Tatsoi has similar care requirements to other brassicas. 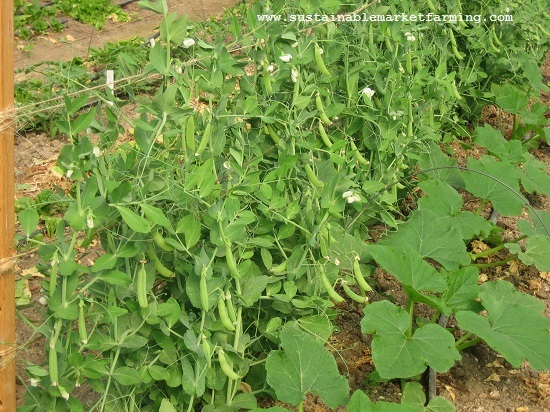 Very fertile soils grow the best Asian greens, so turn in leguminous cover crops or compost to provide adequate nutrition. 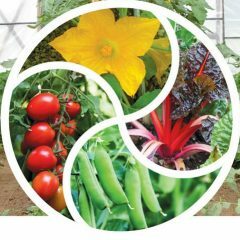 Asian greens are shallow rooted – Pay extra attention to providing enough water to prevent bitter flavors and excess pungency. 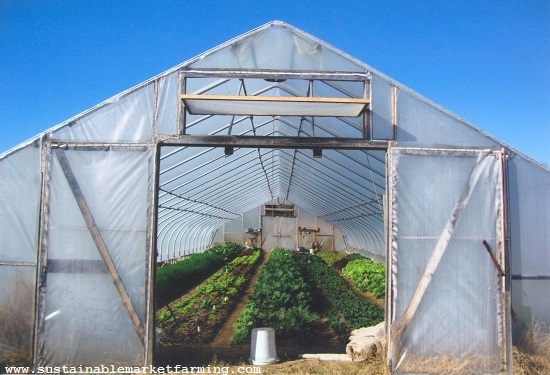 Expect to provide 1” (2.5 cm) of water per week in cooler weather, 2” (5 cm) during very hot weather. 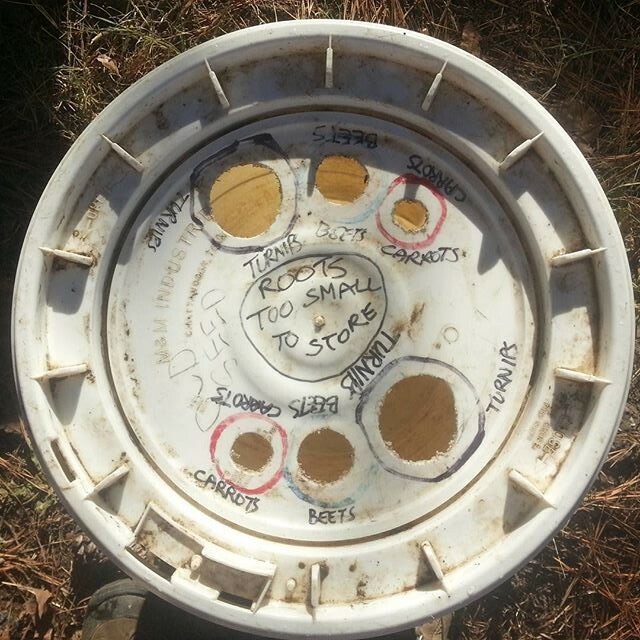 Do close monitoring for pests, which can build up large populations during late summer. 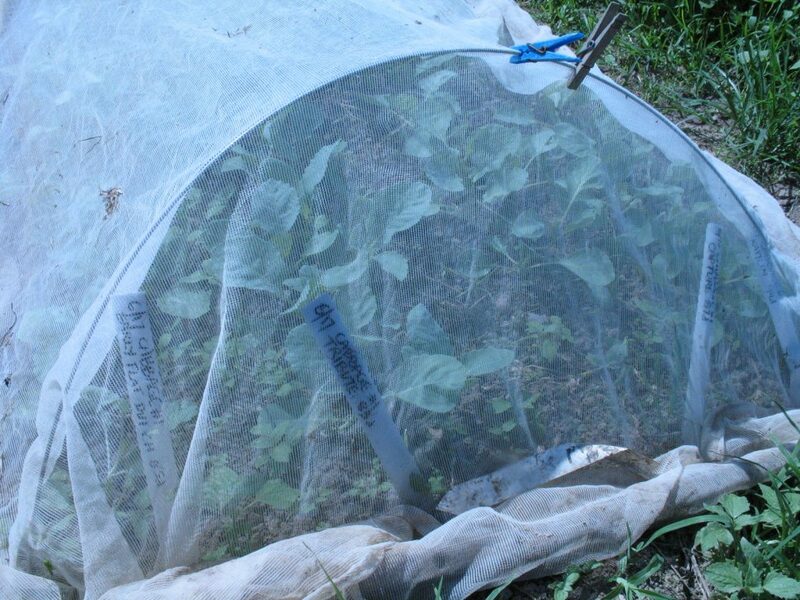 We do nothing special for our tatsoi, but if you have a lot of brassica flea beetles or uncontrolled caterpillars, cover the sowings or new transplants with insect netting such as ProtekNet. 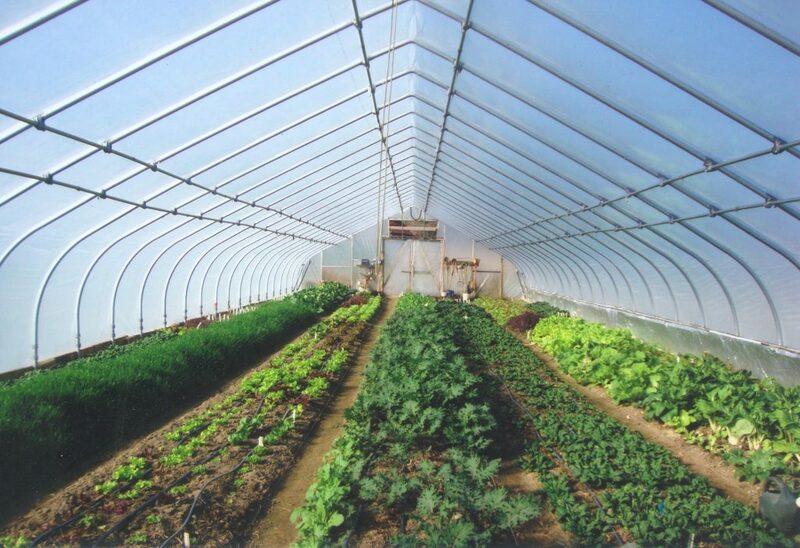 If you are growing tatsoi outdoors in late fall, you could use rowcover to keep your plants alive longer into the winter. 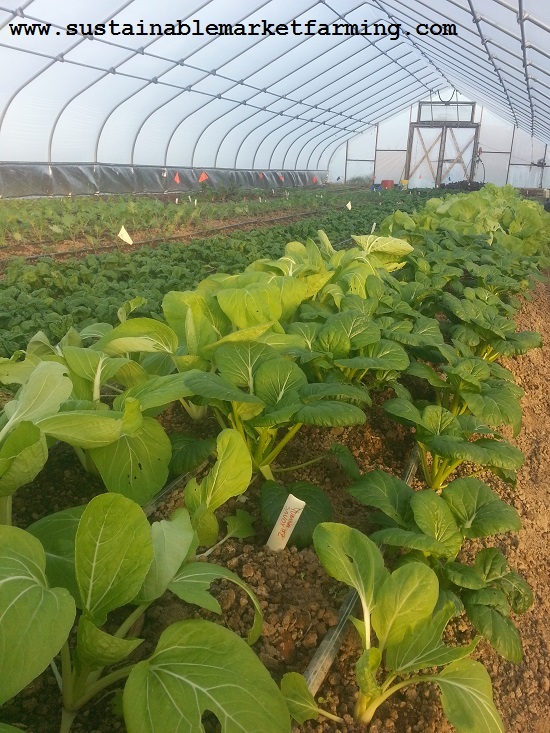 For our hoophouse, we make a first sowing of tatsoi in the very first bed we prepare for winter crops, on 9/6. 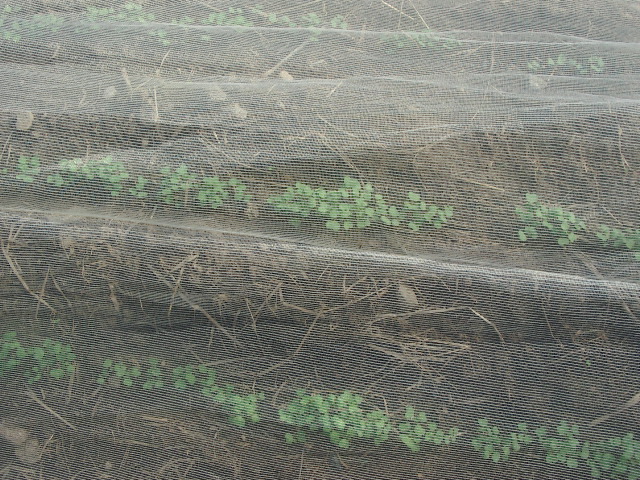 We make a second sowing in mid-November. The first sowing will feed us for two months, November and December. The second sowing will feed us for a much shorter period of time: the second half of February, first week of March. It would bolt if we tried to keep it any longer. 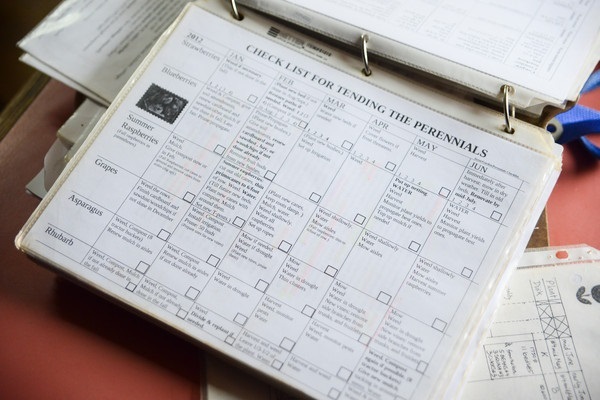 It is entirely possible to make sowings between 9/6 and 11/15, and get harvests that last longer than our 11/15 sowing. The only reason we don’t is that we have so many other crops we love. 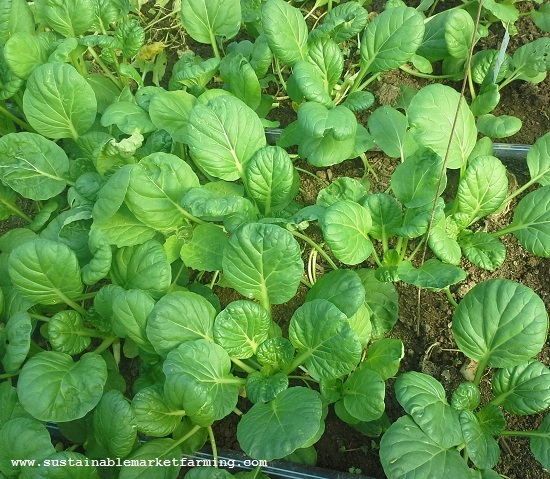 Kitazawa Seeds have a Red Violet tatsoi/pak choy hybrid, with an upright habit. They classify tatsoi as a type of pak choy/bok choy/pak choi, so if you are perusing their interesting site, this is how to find tatsoi. 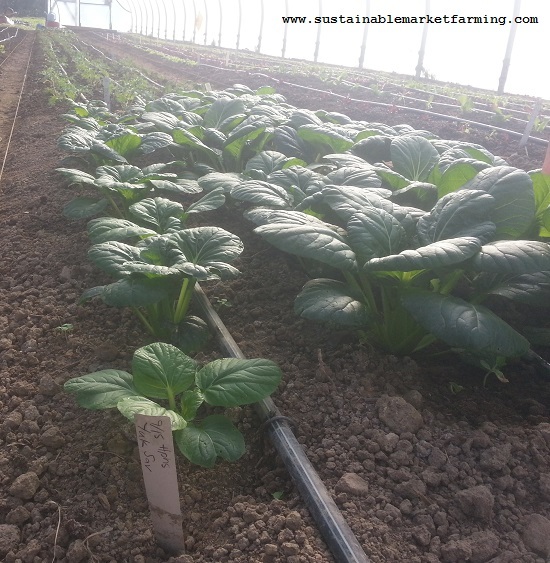 Tatsoi ready for harvesting of whole plants. 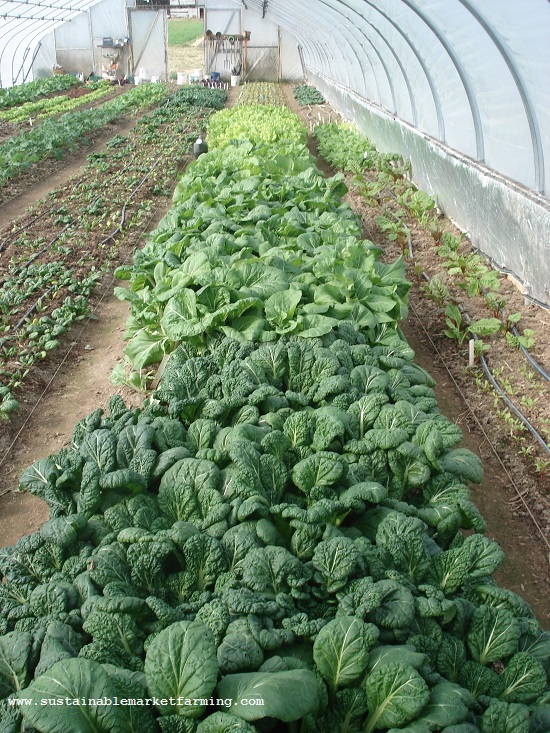 Tatsoi takes 21 days to be big enough for baby salads; 45 days for cooking size. 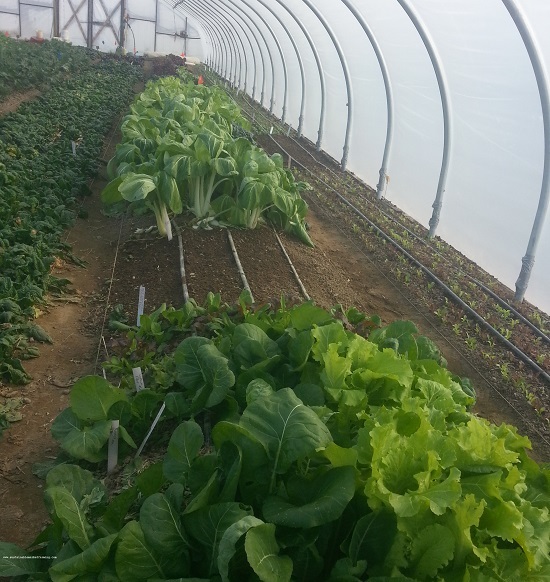 To harvest, initially we thin the rows to 1″ (2.5 cm), using baby plants in salad mix. 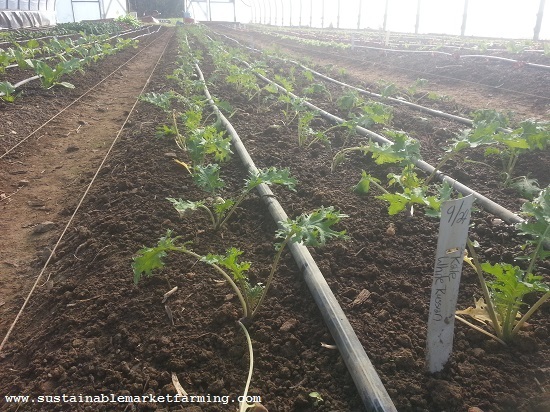 Our first sowing provides thinnings from 10/8, one month after sowing. 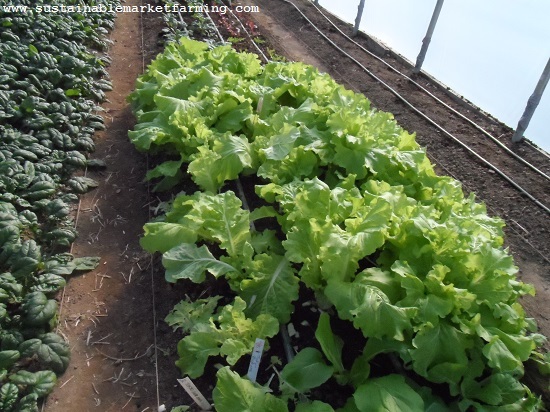 Next we thin to 3″ (7.5 cm), using these also for salad. 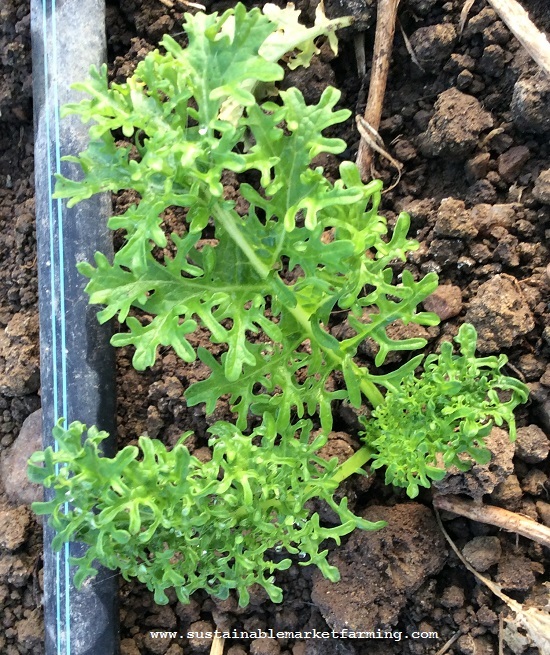 Our next thinning, to 6″ (15 cm) gives us small plants for cooking. 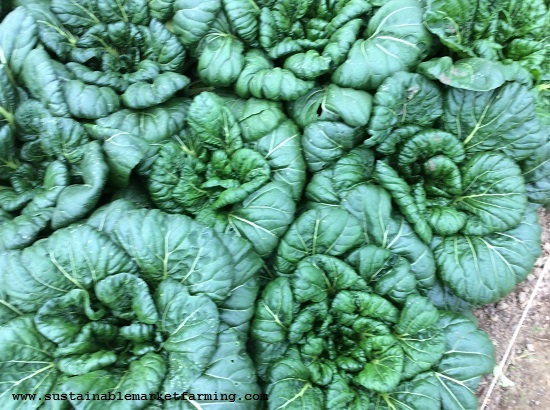 After this, we harvest individual leaves for salad or cooking. 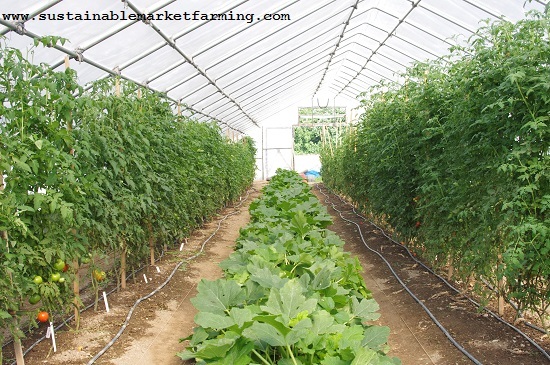 The second sowing provides thinnings 12/27-1/21 approximately. Once we get close to the time the plants would bolt, we pull up whole plants and use them for cooking. We pull the most crowded plants first, giving the others time to grow bigger – they can grow as big as 12″ (30 cm) across. Overcrowding can lead to early bolting. 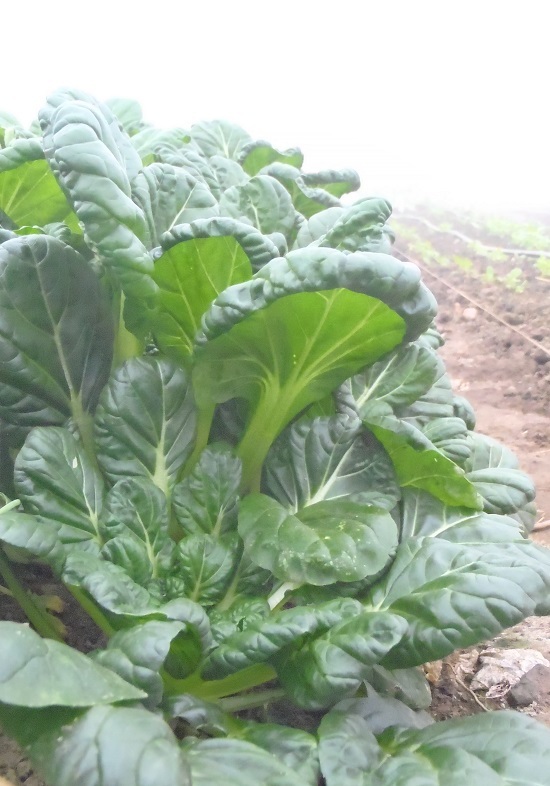 In the big scheme of things, we harvest Tokyo Bekana and Maruba Santoh for heads in December, along with our first tatsoi; our first Yukina Savoy, our Chinese cabbage and Pak Choy in January, our second tatsoi and Yukina Savoy in February and early March. 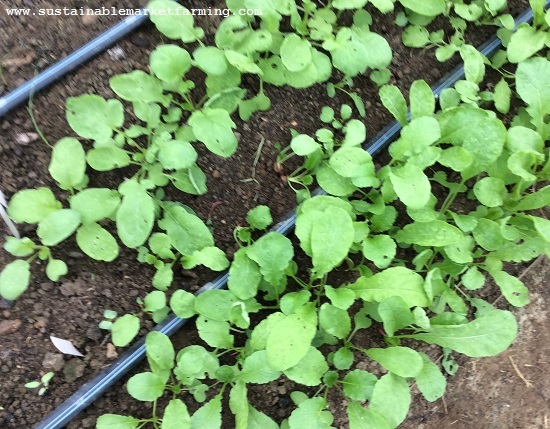 We clear our first tatsoi by 1/14, and use the space to sow our fifth spinach on 1/15. 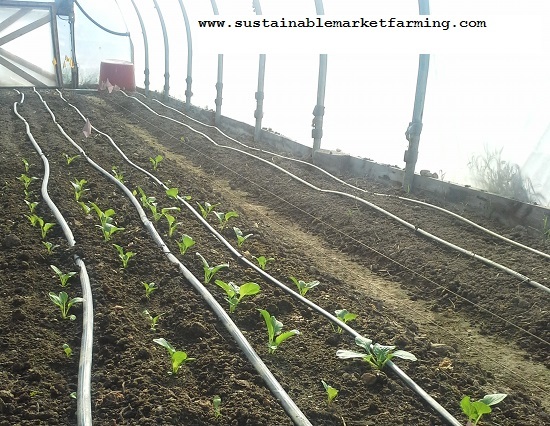 This planting of spinach is to be used as bare root transplants outdoors in March. Our second tatsoi is cleared 3/12 to prepare the space for early summer crops like tomatoes, peppers, beans, squash and cucumbers. Beauty in a tatsoi plant.